WEST HARTFORD, CT- The Hartford Hawks opened a two game home stand Wednesday night when the Bryant University Bulldogs traveled down from Smithfield, RI to take them on. It would be a close match but Coach Theresa Garlacy’s Bulldogs would eventually prevail 3 sets to 1 despite a resilient comeback by Coach Don Ferguson’s Hawks to win Set 3, and nearly take Set 4. Editor’s Note: These reports are somewhat offensive focused as that is what is easier to follow and naturally results in points, but it does overlook key defensive efforts and assists on attacks, though I try to mention any when I can. Defense and the assists are a critically important part of the game, I just wish I could write it all down. Set 1 was a back and forth fight, with each team scoring 25 points for a tie, but Bryant edged the Hawks with 2 more points to take it 27-25. Highlights of the set for the Bulldogs included Kendall Gaffney getting the team on the board early with a whap off the block, Maria Scocca’s kill soon afterward, Kailyn Klein’s kill, Scocca putting the ball down at the net, she later had a service ace, and her teammate Nicole Percz struck with a kill afterward. Gaffney sent an attack in from back court and the Hawks were unable to return it, she later tapped the ball over the defense and in, and added a smash from the net. Scocca came up with one of her many blocks, and later spiked through a U of H block attempt. She and Emily Kaup then shared a block, and Klein a few points later unleashed a blast. Scocca served up another ace, and Kaup and Klein each had kills a bit later. Gaffney and Percz got in on the scoring as the set was wrapping up, and it was Gaffney’s attack just in bounds that kept the team alive during a Hartford set point. Scocca struck with another kill, and the Bulldogs would score their 27th point to take the set. In Set 2, Bryant was able to pull out to a 25-16 win by building a lead mid-set and holding it. For the visitors their highlights included an early Scocca blast, and she teamed with Kaup on a block, and also knocked a kill over, Klein scored a kill, and Scocca added another service ace, midway through the match she sent the ball flying off blockers and out of play, Gaffney’s cross court blast added to their lead, Scocca had another huge block, Jadith Lorenzo served up an Ace, with a block was Scocca again, libero Robyn Gardner picked up a great save during a rally, and Kaup took the point with a bock, Percz followed with a kill, and Mikayla LaRosa stepped up to serve and sent over another ace,late in the set Lorenzo did instead of a set a one handed backwards put over, and Scocca added two big blocks in a row for the last two points of the set. And for the home Hawks, highlights included Ford opening up the scoring, Nethersole’s attack being unreturned, Makowicki tapped the ball over the defenders, Scott’s service went bouncing off a Bulldog and into the seats, Makowicki and Kirton shared a block, mid-set Etta had a great save complimented by Ford taking the ball and keeping it in play, later Kirton added a dive to keep the ball going and Nethersole also kept the ball alive, another good save from Etta followed soon after, and soon after that, Nethersole cross court smashed it, and Ford served up an ace, later Makowicki had another key save, Ford had a good defensive play later on, Cordell won a joust at the net for Hartford’s last point of the set too. Set 3 opened evenly, but Hartford pulled ahead to a small lead and then it was off to the races, the Hawks would eventually stave off the loss with a 25-20 set win. For Hartford their highlights included Cordell hacking the ball off the block and in, a kill from Nethersole, Ford doing her fake set put over maneuver, Makowicki receiving a set and pummeling the ball over, Scott whipping a ball over, a huge kill from Nethersole, and a tap down during a battle at the net, Cordell added a tap attack in, and another kill soon afterward, an immensely long rally came a few points later, Scott added a kill off the blockers, and teamed and Makowicki on a block, Scott delivered a kill to regain a lead, and Makowicki hammered an attack, Cordell directed a set to her and landed it off a defender and outside the lines, she later sent a kill just in bounds to the corner, and Etta had a service ace. On a following rally Ford had a key defensive save and all picked up a point with a jumping attack. Cordell ended the set with a kill as well. For Bryant, early on Klein launched a rocket into the Hartford zone with success and smashed a ball set to her not long after that, Gaffney and Scocca shared a block, and Scocca’s light touch scored a point right after, much later Gaffney had a pair of blasts though Hartford was on their way to a set win. Set 4 quickly started going Bryant’s way and the Bulldogs were leading 23-14, just two points away from the set and match win. The two teams traded points and it was 24-16. Hartford fought valiantly though and pulled the score to 22-24 leading to two Bryant time outs along the way, but on the following play the ball dropped in and the visitors took the win. The highlights for the Bulldogs encompassed Scocca’s tap over the defensive line, a good save by Lorenzo, Scocca whapping down an overpassed ball, a block from her soon afterward, a rocket from Kaup, a cross court kill from Klein to the corner, a service ace by Scocca, Klein’s missile to another corner, Percz’s block, after a time Scocca won a joust at the net and next rally she and Kaup came up with a block, Klein came up with a missile late in the set too. And for the Hawks, Cordell picked up an early kill, Nethersole sent a blast off a Bryant player and into the wall, Kirton had a good save, as did Etta, mid-set Makowicki struck, later Kirton hit a ball off the blockers, and Cordell careened her kill off the defenders and into the wall as well, Kirton one upped that when her attack was hit by an opponent and sailed back over the net out of bounds and way out of play, Ford added a put over and Nethersole hit off the blockers during the Hartford come back, Kirton struck again, Scott and Ashlee Herbst picked up a key block, though much of U of H’s later points came off Bryant attack errors close to the end. Hartford is back in action tomorrow when Sacred Heart comes up to Hartford for a match. Bryant will be back in the state Saturday when they play Central Connecticut in New Britain. 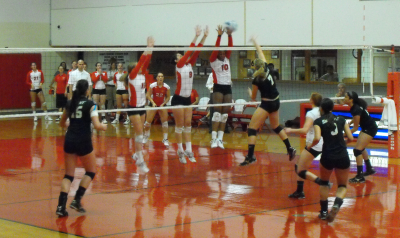 Women’s Volleyball: Sacred Heart tops Hartford in 3 straight sets.